What goes around comes around; what was old is new again. So it goes with decorating. The hot new trends and styles we swore we’d never grow tired of eventually became eyesores, and we’re suddenly ready to trade all the shiny-and-new trends and tricks for the tried-and-true classics that our mamas – and their mamas – have long adored. Better still, some of those old-fashioned decorating moves fit right in with the more contemporary styles we love, too, and they work together to create smart, layered looks that have plenty of personality and loads of charm. Here, we’ve rounded up five old-fashioned decorating trends that are back—and better than ever. Make a killer first impression with a statement-making entry. There are plenty of other places in your home to focus on accessibility and comfort, so dial up the formality and pack a major style punch in smaller spaces that will see lots of traffic and plenty of visitors. 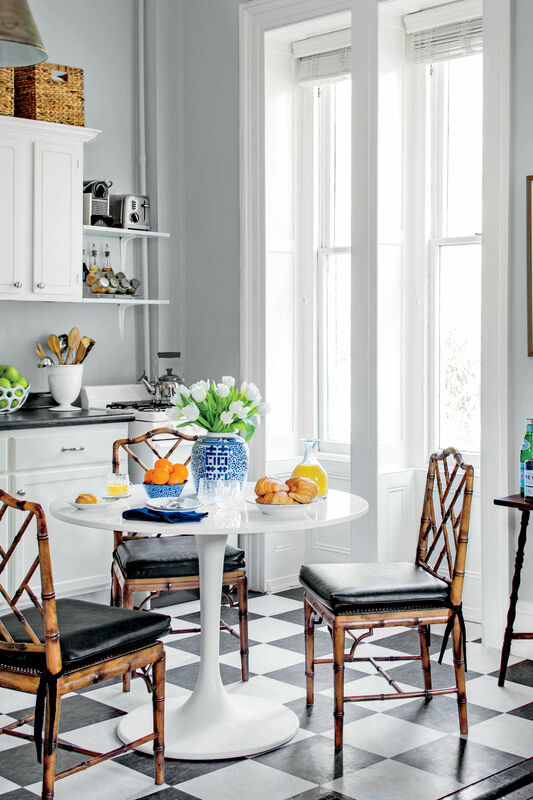 In this 19th-century New Orleans home, for instance, designer and homeowner Grace Kaynor had the wooden floors painted in a faux-marble finish to create a dramatic and unexpected welcome. A glossy red door and sleek console table keep the faux-marble floors from feeling stuffy, while the floor’s oversized pattern makes the narrow space feel larger. Embrace old-school glamour in the dining room with an antique chandelier that throws and catches light in equal measure. Hang the chandelier sky-high above your table for a more modern feel, or pair it with more natural elements, like a seagrass rug, to dress it down. In this South Carolina rancher, designer Alaina Ralph proves that crystal chandeliers (even those of the antique French variety!) can go with anything and everything, from a simple wood dining table to ultra-mod malachite-patterned curtains. Whether you inherited silver from your great aunt or have racked up your own collection of oyster plates from your own antiquing adventures, it’s time to brush the dust off and pull them out of the cabinets in which you’re so carefully storing them. Like hand-me-down jewelry or family heirlooms, collections are meant to be seen and enjoyed, plus they’re instant character builders in any space. Designer Allison Allen’s ginger jar collection works as a consistent design element throughout her Atlanta home, appearing everywhere from the console in the entry to the dining room table (pictured above). If you’re suffering from shiplap fatigue, you’re in luck: Dark wood paneling is swinging back into style. Whether it’s original to the home or something that’s added later, dark wood paneling injects rooms with old-soul warmth that’s difficult to replicate with paint alone. If you’re working with original wood paneling, freshen it up with a new coat of varnish, like designer Charlotte Lucas did in this South Carolina living room, then balance out its masculine feel by pairing it with sweet hues and soft fabrics. Bring on the sumptuous fabrics. Velvet, leather, linen: The good fabrics aren’t just for your no-children-allowed/”don’t touch that!” rooms anymore. With all of the available stain- and-spill-proof treatments and high-end indoor/outdoor fabrics on the market these days, there’s no reason to save the lux fabrics for the spaces you only use on special occasions. Instead, invite velvet into your family room, upholster your dining room chairs in linen, and put your favorite splurge-worthy fabric on the breakfast banquette.